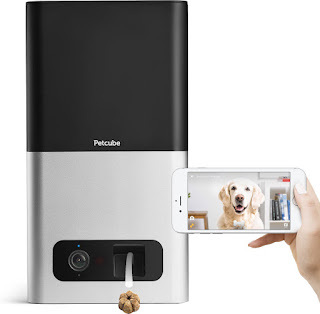 When Petbarn approached me asking if I would consider reviewing the Petcube Bites HD Pet Treat Camera, I was definitely interested since this high-tech gadget was one of our suggestions for Christmas presents for dog lovers last year. 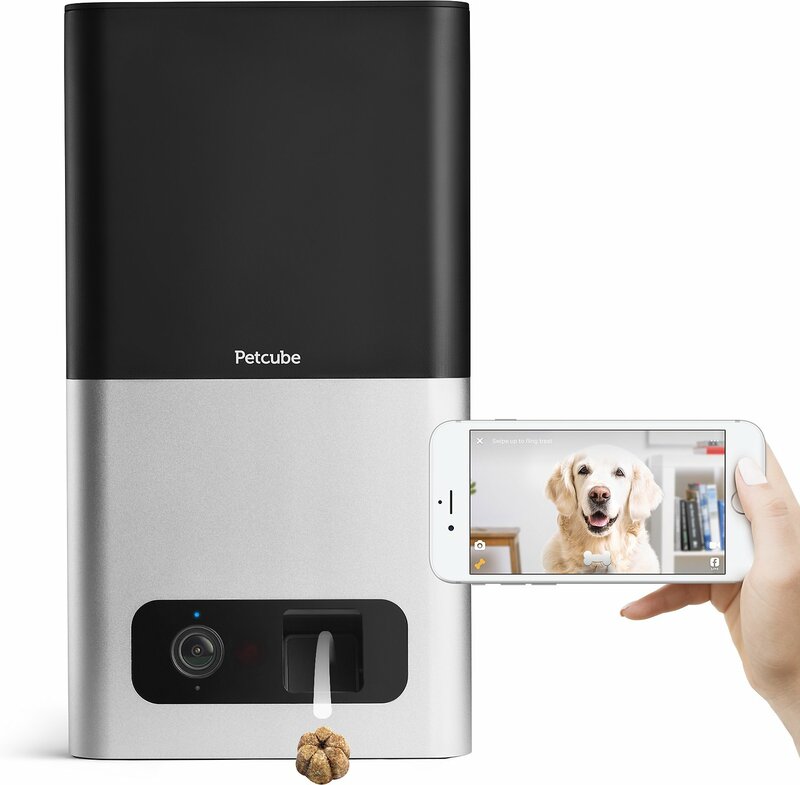 Unlike its predecessor - the Petcube Camera, the Petcube Bites is more than just an HD pet camera… It is also interactive, allowing you to not only watch your dogs when you’re away, but you can talk and play with them too! The camera features a 2-way audio so you can attract their attention by talking to bring them within viewing range and you can also hear them. It gives you the freedom to interact with them at any time via the Petcube app so you can watch a video stream on your smartphone or tablet, you can speak to them and also fling some treats remotely. 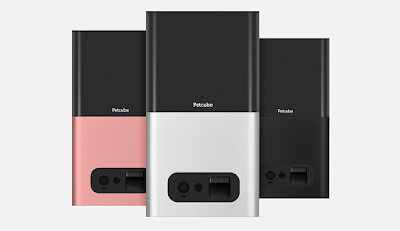 The Petcube Bites is extremely well presented and the packaging itself highlights useful information about the set up of your unit and its many features, so please take the time to read the box and check that all items are ready for assembly. Upon unpacking the Petcube Bites, our first impression was that it was much larger than expected, huge in fact! Clearly the glamourous lifestyle shots we’d been browsing must have been taken from quite a distance in a studio ... Once you’ve accepted that this monolith is not in the running for a discreet home security camera, you will start enjoying the technology behind it and its features! 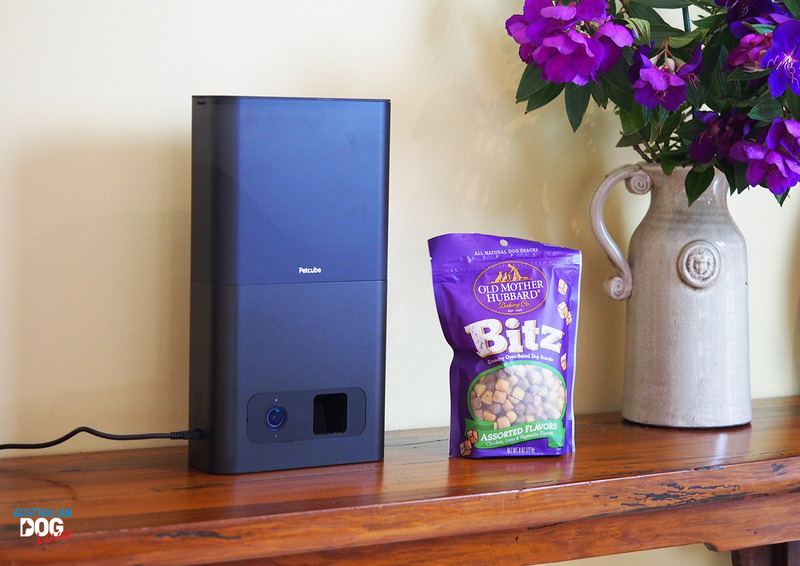 You will find a pack of Old Mother Hubbard's Bitz dog snacks included in the treat dispensing container (you'll need to open the pack and load the container from the top before you start using this feature). This selection is the result of a partnership in the US between Petcube and dog food company Wellness but you can use any brand of dog treats (ideally use crunchy treats and their size must be under 1 inch or 2.5cm). The container will hold up to 100 treats. The detachable treat container is dishwasher safe or you can wash it by hands. If you’re new to the Petcube family (also includes the Petcube Camera and Petcube Play), you'll be up and running in 4 easy steps. Our unit clearly came straight from the US as the plug did not meet the Australian standards so we were lucky to have an power adaptor at hand. This makes for a pretty unsightly set-up unless you have the right piece of furniture so you can hide both your plug/adaptor and the very long cord. Our advice is to select the room where you receive the strongest WiFi signal however this also needs to be a room where your dogs will spend most of the day. If the reception is poor, then you could end up with buffering and pausing during live video streams. Connecting to your Petcube Bites is done using the app on your phone and it only took a couple of minutes. The LED light notifications on the front panel will guide you throughout this process. SO WHAT CAN YOUR PETCUBE BITES DO? The only reason we’d personally purchase a Petcube Bites would be to have the ability to watch our dog(s) and talk to them remotely when we’re travelling away from home. 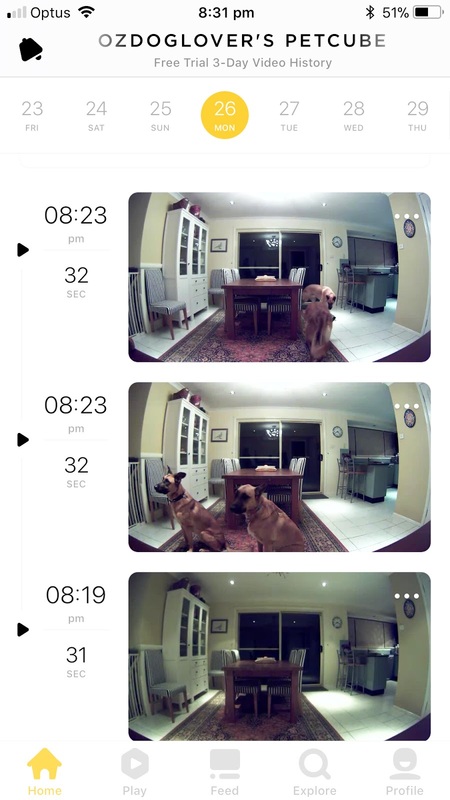 The camera has the ability to record videos and you’ll also receive alerts on your phone about your dog’s recent activity. The HD video stream from the Petcube Bites is clear even in low light (it comes with night vision so you could potentially check in on your pet at night – likely to be more interesting if you have a cat!). The camera features a 138-degree wide angle field of view with 3x digital zoom so you really get a wide view of the area you place the Petcube Bites in. This is great if your dogs spend most of their time in this one room so you can check what time of the day they're playing or having a snooze. If they have the run of the house, well you may see them flashing past from time to time, especially at mail delivery time! Your Petcube Bites can detect sound and motion so if anything is happening near the camera, you'll get a ‘bark alert’ i.e. a message on your phone. It sounded more like a cat’s purr than dog’s bark to me but it certainly grabs your attention! The feature is useful if you’d like to train your dog to come into range so that you can toss them a treat. If your family and friends are looking after your dog or are simply obsessed with him, you can also share access with them. We put the device through its paces a couple of weeks ago all the way from Perth and it worked brilliantly! The dogs heard a voice coming out of the Petcube Bites and immediately came within range to investigate. Our senior dog was very confused and he kept checking all the rooms to see where “daddy” was hiding! The most unique feature is the ability to throw treats to your pet on demand or on a schedule. It may take a bit of getting used to for some dogs as the mechanism launching the treats is a bit noisy for our taste so our female Malinois wasn’t a fan and she promptly exited the room upon hearing that noise. Her brother did quickly catch on that noise equals treats incoming and stuck around to sniff them out. We found that the number of treats dispensed was very random (as low as 2 or as many as 7 or 8 were loosened in one hit) and a couple occasionally sat at the bottom of the shoot or on the ledge of our table. My concern with our pack is that if no one was at home, one of our dogs is bound to investigate and would potentially topple the whole thing! 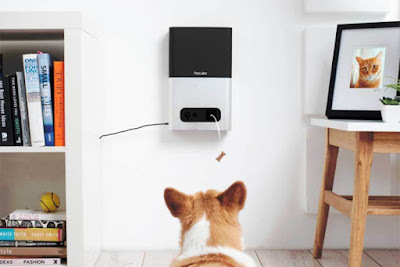 Unless you have a solid piece of furniture or your dog is too small to reach the unit, I’d personally opt to mount the Petcube Bites on the wall, if you're happy for it to be a permanent fixture. Please note that the treat dispensing feature should be used as a training aid only to reinforce good behaviour which to us means using the ‘on demand’ setting rather than throwing treats randomly on a schedule – though it may be entertaining for your work colleagues to watch at lunch time! Treats dispensed should never replace your dog’s normal meal so you’ll need to adjust the feeding quantities at meal times. It comes with a one year limited warranty. As with any electrical device, ensure you protect the power cord from being walked on, pinched or chewed by your pets. Never leave the unit in direct sunlight to avoid overheating, especially during our brutal Aussie summers! It sounds obvious but don’t drop, hit or shake your device and use the recommended size treats to prevent mechanical problems. If you only use the Petcube Bites occasionally or leave it unused for a long period, please keep in mind the treat expiration dates. It may best to discard the old ones and refill the container with a fresh supply of treats. This is not a cheap tech gadget so you will need to ask yourself if you actually need one of these but with Mother's Day around the corner, it's a cool present idea for the dog lover in your life. 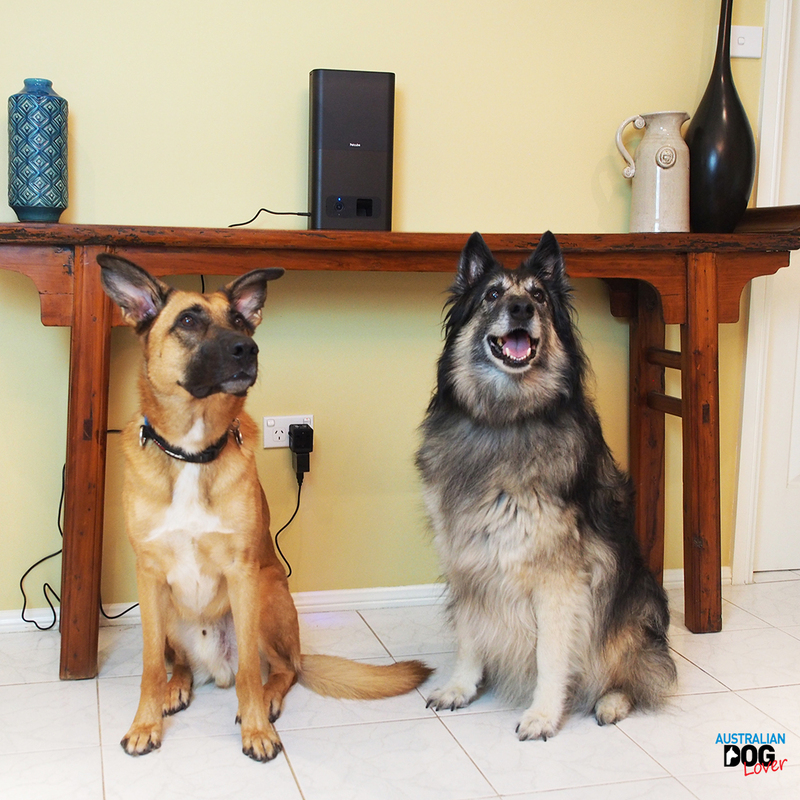 If you’re travelling frequently leaving your beloved pooch in the care of family or friends in your own home, we think it’s a great invention to get your “dog fix” as they’ll get used to interacting with you when they hear your voice. As mentioned before, I’d be wary of using the treat dispensing feature too often as you can’t tell how many are launched each time and you could end up giving your dog a lot of unnecessary extra calories. Only the Matte Silver and Carbon Black models are currently available in Australia and from a home décor perspective, we’d like to see the Rose Gold model - our personal favourite - also offered to Australian pet owners. Please keep in mind that unless you take a Petcube Care Membership - this subscription gives you up to 30 days of video history (24/7) plus savings on other products within the range - you only get a 4-hour video history so if you end up with a funny video, remember to save it straight away! You get to trial the free 3-day Membership when you first use your Petcube Bites and you can then decide if you’d like to retain the ability to record 24/7 (it costs USD$49/year). Disclaimer: Product loaned by Petbarn for editorial consideration.